This is the phrase Islip, New York driver Timmy Solomito used on multiple occasions when discussing his life and racing career to date. 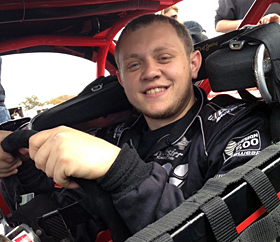 In his first UNOH Battle at the Beach attempt on the Daytona International Speedway Superstretch in February, Solomito was a contender throughout practice, qualifying, and the beginning of the NASCAR Whelen Modified Tour race. After damage put him several laps down, he was still all smiles knowing the car was capable of running with the leaders. Adding to the life-changing events to take place already in 2014, over this past weekend Solomito proposed to his girlfriend Shannon. “It all went according to plan. Everything is going well,” Solomito said. Solomito couldn’t be happier to have her by his side throughout all of his efforts. Now the positive focus shifts to the weekly racing season. Solomito plans to expand his schedule to about nine Tour races, mostly the Thompson Speedway Motorsports Park and Stafford Motor Speedway shows. It was at last year’s Icebreaker in which he made his Thompson debut, and solidly finished on the lead lap in 10th place. “If we could get a top five at Thompson or Stafford it would show people we can do this,” Solomito said. This year they plan to bring the same family car which has been sitting ready since late last year. In 2014, pre-season plans were a little different but turned out to be the same. Due to the above average amount of snowfall and cold weather throughout the Northeast, preseason test sessions were canceled at Thompson. Preparedness in racing runs in the family for Solomito. His dad used to race Pro 4s at Islip, both of his older brothers have raced regularly at home track Riverhead Raceway and his cousins are current and former Tour regulars Eric and Kevin Goodale. It was veteran driver Dave Brigati though that offered Solomito his first break in a Modified at Riverhead after seeing his success in karting and Legends cars. Fast forward to 2013 when the driver now known as “The Natural” paired up with 1994 Tour champion Wayne Anderson for five feature wins and a runner up finish in points at Riverhead. In addition, he continues to actively compete in the Legends division in which he won the 2008 track championship and finished second in the points as well in that car last year. Current plans are for the car they raced at Daytona to compete regularly at Riverhead for the track championship. He will certainly be a factor when the Tour comes to town twice as well. The team won the pole and finished third there last September. 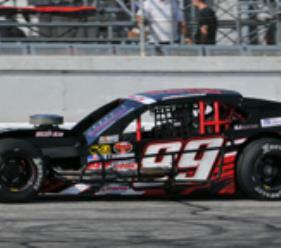 The remainder of Solomito's 2014 Tour races will see a brand new Troyer Modified with a new Performance Technology engine enter the fleet for races that do not conflict with the Riverhead schedule. That car will also be owned by Anderson. Anderson has proven to be a tremendous help to boost Solomito’s experience and performance. Not to be forgotten, the two people that he thanks the most for his racing career are his parents. Right now, life is good for Timmy Solomito and he is enjoying every minute of the opportunity.